I’m maybe 150 feet off the ground, stuck on the second pitch of one of Looking Glass Rock’s most iconic routes, and wondering where the hell I’m supposed to go now. The problem is there are no obvious hand holds in front of me. Looking Glass is notorious for this. This big, sloping granite dome popping out of Pisgah National Forest’s lush canopy is known for its friction climbing, which means you have to palm slanting features with your hands and trust the rubber on your climbing shoes to get you up the rock. If you’re used to the chunky graspable features of sandstone, or the candy-colored plastic handholds in climbing gyms, it takes a couple of pitches to get used to friction climbing. I’m still in the process of learning how to trust my feet as I make my way up and across the second pitch, which follows a seam of quartz that streaks diagonally across the dome. Really, it’s all about the feet. It makes me wonder how the first guys to climb this rock did it. They didn’t have the luxury of using $150 climbing shoes with super-sticky rubber soles. They climbed this rock in hiking boots and motorcycle helmets. rock climbing rating: Rock climbs are rated 5.0 to 5.15, the later being as hard as it gets. With some practice, a beginning climber can climb in the 5.8 range with confidence. “It took us two years of attempts before we finally made it to the summit,” says Steve Longenecker, who along with Bob Watts and Robert John Gillespie is credited with having the first ascent of Looking Glass Rock. They started trying to climb Looking Glass on the north face and made several attempts, but were stalled by steep, overhanging moves that were beyond their ability at the time. That was 1964 and ’65. It wasn’t until December 19, 1966, that they bushwhacked around the mountain to the west face of the rock and slowly made their way up a route they dubbed “The Nose,” using their helmets for protection against falling rocks. 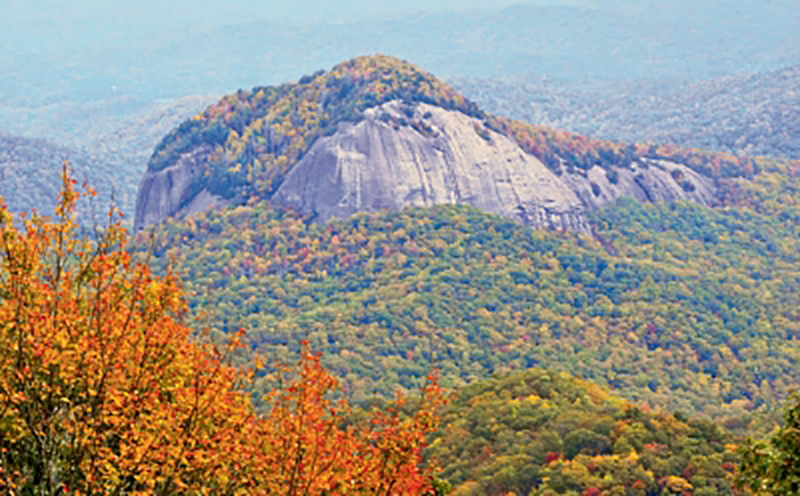 Now, 50 years later, The Nose of Looking Glass is considered the most iconic climb in North Carolina, if not the entire Southeast. “A lot of folks consider that route to be the only thing worth climbing in the state. That’s not true, but it’s definitely on the tick list of most climbers,” Longenecker says. In 1966, there wasn’t much climbing going on in North Carolina. The U.S. Army Special Forces were practicing their alpine skills on Table Rock. A few people were climbing Hanging Rock and Crowders Mountain, but rock climbing in general was still a little-known pursuit. Longenecker had only recently established the first summer camp rock-climbing program in the South at Camp Mondamin in Henderson County. As he began exploring the various aspects of Looking Glass, he used the camp’s rudimentary gear—namely pitons, which were metal spikes with rings that you had to hammer into the rock. Get a piton into the crack of a rock and you could run a carabiner through it for protection against a fall. They didn’t have modern belay devices either, so the belayer had to wrap the rope around his body for friction. And the only harnesses were homemade, from ropes and nylon webbing. Our situation today is a bit more well-informed. Our gear is state of the art (spring-loaded cams for protection, lightweight harnesses, no motorcycle helmets), and each demanding move of The Nose is well documented. I’m lucky enough to have Michael Reardon, a veritable Looking Glass scholar, as my guide up The Nose. He leads the pitch, placing the mechanical cams in the wall and securing our rope, and I follow, removing the devices as I ascend. Reardon is a guide for Climbmax Mountain Guides and a guidebook author with two books under his belt. He’s working on his third, Southern Pisgah Rock and Ice, which will detail Looking Glass’ classic routes, like The Nose. The “eyebrows” Reardon is referring to are downward sloping overhangs that punctuate the surface of the dome. From a distance, they look like solid rock holds, but on closer inspection, they’re too sloping to provide anything solid to grasp. Sometimes, you can jam your toe into the underside of an eyebrow and find a bit of leverage. Again, it’s all about the feet. The Nose has four pitches in all, rising 450 feet from the forest floor to the summit, which is tufted with low grass and gnarly, wind-worn trees. The second and third pitch are the toughest, rated 5.8 because of a few puzzling moves that demand a long reach and blind faith in the power of the space-age rubber on your feet. I could see reaching one of these crux moves and wanting to call it quits, rappelling back to the ground and looking for a less daunting way up the rock, but somehow, Longenecker and his crew had the nerve to push through to the top. The fourth and final pitch, referred to as “the hero lap,” is an easy series of ladder-like moves over gently sloping granite that you can climb quickly and efficiently until you find yourself standing on top of the rock, looking over Pisgah Forest and the Blue Ridge Parkway far beyond. It wasn’t that easy for Longenecker and his crew in ’66 because the entire pitch was covered in moss and lichen; it had never been climbed before, and they literally had to blaze the route as they ascended. Longenecker has a number of impressive first ascents to his name, including some steep lines in Linville Gorge and the daunting Devil’s Courthouse. But The Nose and the other routes he put up on Looking Glass will always be the most revered of his climbing accomplishments. Now in his 70s, Longenecker hasn’t climbed The Nose since 2004, when he fell leading a small group up the face. “I went back one more time to clear that section but I haven’t been back since,” he says. “It’s kind of like a boxer taking himself out before he gets whooped too many times. It still bothers me though. On a pretty day, I still wish I was on Looking Glass. But I don’t want to just climb it; I want to lead it again. Maybe one day, someone will take my ashes and pour them over Looking Glass.” But until that day comes, Longenecker can find gratification in knowing that he and his friends truly did lead the way up one of the Southeast’s foremost landmarks for climbers.